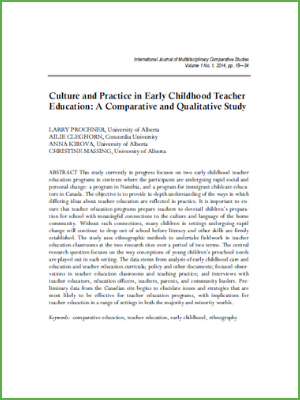 Culture and Practice in Early Childhood Teacher Education: A Comparative and Qualitative Study focuses on two early childhood teacher education programs in contexts where the participants are undergoing rapid social and personal change. The first is a program in Namibia, and the second is a program for immigrant childcare educators in Canada. The study's objective is to provide in-depth understanding of the ways in which differing ideas about teacher education are reflected in practice. It stresses the importance of education programs that prepare teachers to ensure young children are ready for school, and maintain meaningful connections to the culture and language of the home community. Without such connections, many children in settings undergoing rapid change will continue to drop out of school before literacy and other skills are firmly established. The study uses ethnographic methods to undertake fieldwork in teacher education classrooms at the two research sites over a period of two terms. The central research question focuses on the way conceptions of young children’s preschool needs are played out in each setting. The data stems from analysis of early childhood care and education and teacher education curricula; policy and other documents; focused observations in teacher education classrooms and teaching practice; and interviews with teacher educators, education officers, teachers, parents, and community leaders.